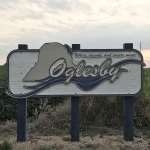 The city of Oglesby is one of the recipients of an open space grant program that the state of Illinois runs. The city’s getting $400,000 and will put in nearly $200,000 of its own money to develop Senica Square in downtown Oglesby. The half-acre site will be where a four-season community park is developed with space for outdoor shows, picnicking, and ice skating. It’s on a site where a run-down commercial building used to be. The North Central Illinois Council of Governments helped Oglesby write the grant application.